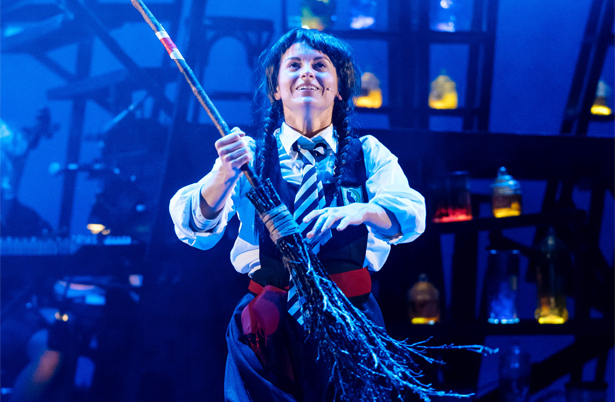 Review: The Worst Witch (touring) Curve Theatre Leicester – East Midlands Theatre. 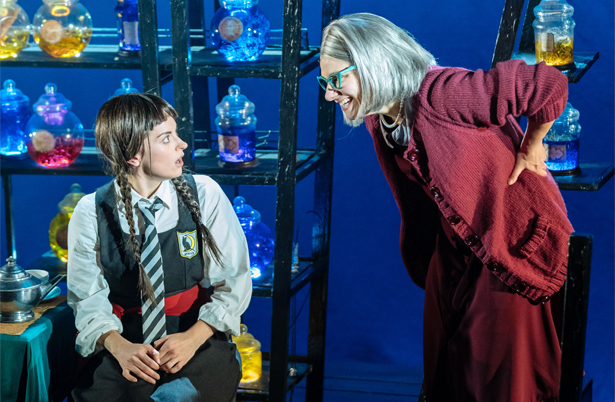 If you are considering going to Curve Theatre to catch Royal and Derngate’s touring production of The Worst Witch then we suggest that you fly over there on your proverbial broomstick – or just book on the internet or by phone – pretty darn quick. This fantastic fantastical show is a perfectly magical night out for the family with children 7+ years. Played with tremendous gusto by an all female cast (and their cats) and adapted from Jill Murphy’s original and very popular books by Emma Reeves this stage production is a real winner. We were spellbound right from the start in this play within a play. Fans of the books and television versions will not be disappointed. Miss Cackle’s Academy for Witches is perfectly brought to picture book life by Simon Daw’s stage designs, Aideen Malone’s lighting design and Leigh Davies’ soundscape. Luke Potter’s musical compositions add yet another layer of mystery and thrill to the production. Theresa Heskins directs this super sharp production featuring broomstick flying lessons, disappearing spells, aerial work and real life actors/collaborators with aplomb. The whole energetic company work well together with some stand out performances, especially from Danielle Bird as our plucky heroine Mildred Hubble, Rosie Abraham as the perfectly perfect (not) snobby girl Enid and Consuela Rolle as the sparky girl, Ethel. On the adult side Rachel Heaton is triumphantly humourless as Miss Hardbroom and Polly Lister is superbly double sided as the nice Miss Cackle and her evil twin Agatha. Live music is performed by Megan Leigh Mason (Miss Drill), Molly-Grace Cutler (Miss Bat), and Meg Forgan (Fenella). 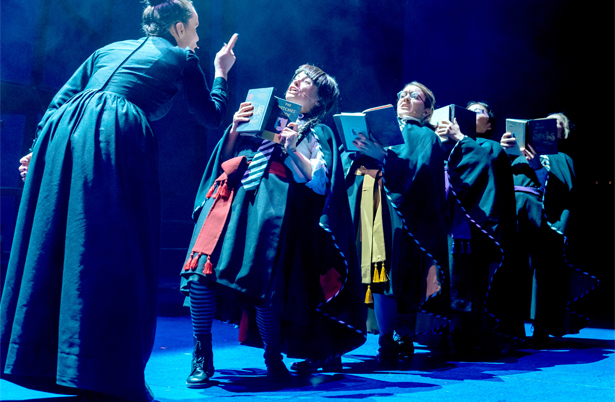 Other pupils are convincingly and energetically portrayed by Emma Lau (Drusilla) and Rebecca Killick (Maud). 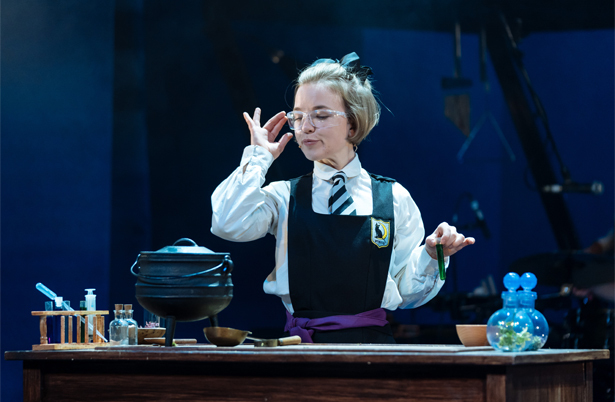 As well as being adventurous in nature, The Worst Witch play also considers the themes of nurturing and potential for those who happen be outsiders and through the stage adaptation we celebrate the potential of theatre to illuminate, broaden imaginations and achieve the seeming impossible. And thus it is impossible not to enjoy this erstwhile show with or without a laughter potion or a shenanigans’ spell. And did we mention that there are cats in it too? 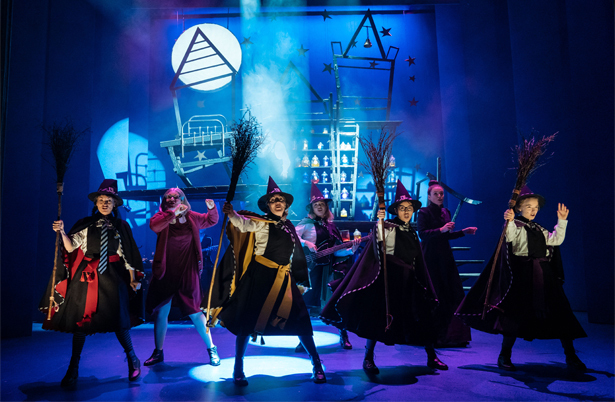 The Worst Witch runs at Curve Leicester 19th – 24th March 2019.